Do you require high-quality, cost-effective wristbands? Ideal for school or business events, wristbands provide an effective method of controlling pupils, guests or visitors at a wide variety of functions and events. The compact Zebra HC100 wristband printer allows you to produce wristbands quickly and easily using your desktop computer, with no special software required (templates can be created using everyday applications such as Microsoft Word). 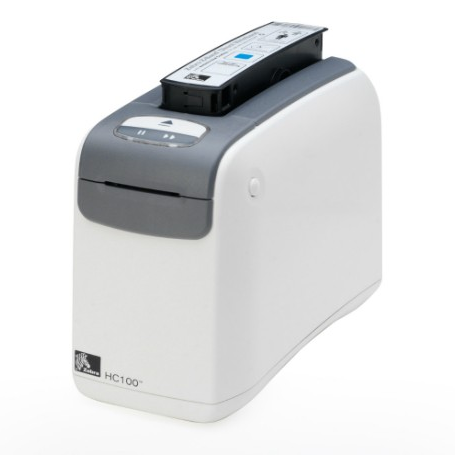 There is no need for extensive training to operate the user-friendly, plug-and-play printer, simply insert the appropriate wristband cartridge into the HC100 printer, create your wristband design and print. The printer plugs into your computer via USB connection and is easy to maintain. For pre-arranged events, the wristbands can also be customised for a list of attendees, or for school trips or club event use, and can include relevant safeguarding information such as emergency contacts or medical information. The Zebra HC100 produces wristbands suitable for healthcare, hospitality, and leisure applications. You will no longer need to outsource your wristband printing, just pop the wristband cartridge into the printer and it automatically detects the wristband size, immediately calibrates, and prints for simple and cost-effective wristband printing. Click here to view the great value Zebra Wristband Printer Package.